Happy Saturday Ladies! I wanted to share some photos and experiences about the first 4 weeks and how they directly affected me. I'm going to try to be as real as possible and these pictures are meant to show that we are all human and although we all recover differently, we have the same feelings and concerns. I wish I could've taken a picture from the first or second day because it went down a lot between days 1 to 3 but I was just a little preoccupied ;) Day 3 and my belly button is still out and my tummy seriously feels like mashed potatoes in a sack lol but I didn't expect anything less! - Bad: My biggest pain right now is my lower back. Since I had to have two epidurals I think something happened because now I get numb around my sacrum if I sit for too long and it becomes painful. It's gotten a little better but I'm going to get it checked out if it's still happening in another month. I have previous back problems on L4-L5 so I have a feeling I tweaked something while pushing because I was so numb. Has this happened to anyone else?? -Bad: Anyone else's wrist's falling apart?? Between my back and my wrists I'm really feeling my age right now!! My left wrist down my pinky is having a very hard time and is starting to click. Yes I'm complaining about pinky pain. Hey even the smallest things can cause the most pain! -Good: Being able to stretch and twist my back again!! Almost as good as being able to sleep on my back again, so amazing...it's the little things. -Bad & Good: My emotions are still super unpredictable, I just sobbed over a father/daughter commercial. 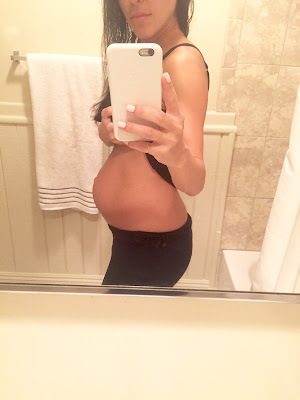 Thankfully my entire pregnancy till now I haven't really flown off the rails (ok, maybe a couple times...because he didn't understand I needed to eat NOWWW!) haha. Rod says he's surprised and that I've been awesome...I tell him that I have to be otherwise he won't want to have another baby! !